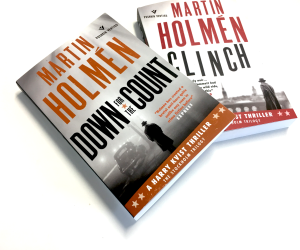 ‘Down for the Count’ is the second novel in the Stockholm trilogy by Martin Holmén. 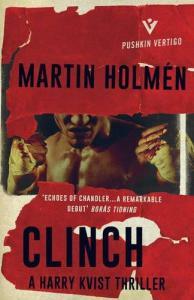 Like the first, ‘Clinch’, it’s a well-crafted noir that doesn’t pull its punches, hitting you in the guts with stark surprises and with a setting, 1930s Sweden, which is quite far in time yet disturbingly familiar. Stockholm, November 1935: Harry Kvist, a former sailor and rogue boxer with a significant weakness for schnapps and young men, has just been released from Langholmen prison, where he spent a year and a half on an assault charge. Though he does have a rented flat to go back to, where he hopes his prison sweetheart – a blond young man nicknamed Doughboy – will join him upon his release the following week, Harry’s future looks none too bright. Harry is in his mid-thirties and determined not to do time again. He dreams of making a boxing come-back and of stepping up from his usual work as debt-collector for minor businesses and enforcer for disreputable individuals. To begin with, the best he can do is work as part-time assistant undertaker to his landlord and friend Lundin, but he soon eyes the possibility of taking over the neighbourhood cigar shop, whose sole proprietor is retiring. Such is the world of Harry Kvist: as rogue a character in the noir landscape as you’re ever likely to find, a denizen of a tough world which Holmén paints with unsparing realism. The historical detail of not-so-picture-postcard Stockholm he weaves into the novel is almost obsessive, and occasionally slows down the pace a touch, but it’s very effective in transporting the reader to a world that feels even more distant from the contemporary than the gap in time suggests. The difference is in the widespread poverty and the crystallised social stratification Holmén describes, and which makes it fiendishly difficult for anyone mired in the sort of existence Harry and his peers live to escape. Harry Kvist is a realist and knows his limits. He is not above violence and murder –strictly out of necessity only – but he is a man who still has a firm, albeit skewed, moral compass. One which leads him to take an interest in the death of Beda Johansson and the imprisonment of her dim-witted, deaf-mute son Petrus. Beda, the single mother of twenty-something Petrus and the owner of the local laundry, was a friend of Harry’s, one of the very few people in Sibirien, the modest neighbourhood where he lives, who would not turn up their nose at his less-than-reputable lifestyle and career. Beda was terminally ill with cancer and, before Harry went to prison, he promised her he would keep an eye out for Petrus after her death. Coming back to Sibirien, Harry discovers Beda has been murdered, battered to death by Petrus, who has been locked away in a psychiatric hospital. Harry refuses to believe Petrus could have murdered his mother, and starts ferreting around for a motive. When he finds a bullet lodged in the wall of the laundry’s basement, his suspicions mount and he decides to find an explanation for himself – one that obviously does not involve going to the police. He discovers that Beda had an estranged daughter who lives not far from Sibirien and actually works in the area, and so we meet the other leading character in the novel, Elin Johansson. She is the polar opposite of a femme fatale: neither young nor beautiful, she’s missing half an ear and smells of fish from sharing a flat with a herring factory worker. She initially has no time for Harry, but his stubbornness at wanting to find out, purely to honour his promise to Beda, why she died and why Petrus has been secreted away in a psychiatric hospital (the police, incidentally, have no record of him being taken there), Elin is eventually roped in. After a somewhat slow start, this is where ‘Down for the Count’ begins to pick up both pace and interest, as Holmén unleashes the odd but effective ‘sleuthing’ pair of Elin and Harry. Their search takes them on a gruesome tour of how the retarded and mentally sick were treated in 1930s Stockholm, and will eventually reveal a horrific tale of exploitation which reaches to the very top of Swedish society. 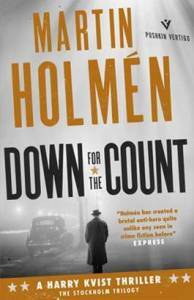 Holmén is not averse to some quite open social critique, which Swedish crime fiction has always been fond of since the genre was defined in the 1960s, in the brilliant inspector Martin Beck novels by Maj Sjöwall and Per Wahlöö. ‘Down for the Count’ is a fully fledged noir rather than a classic detective novel, but no less gripping for this. Holmén’s authorial decision to portray Harry as hovering between the tug of his old vices and semi-bourgeois aspirations (he even decides to try and get in touch with his teenage daughter, now living with her mother in the USA) is a brave one. 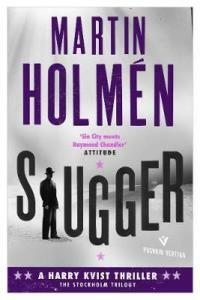 It allows Holmén to add depth to his main character, though to begin with it makes him less punchy, if you’ll pardon the pun. But Harry Kvist is a uniquely unconventional character who certainly deserves to be fleshed out fully, and I unreservedly put my trust in Holmén for the third instalment of the Stockholm trilogy, soon to be published by Pushkin press.